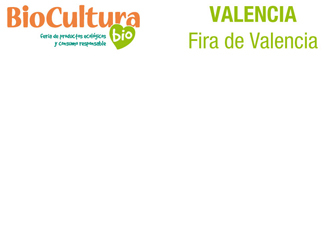 From 7 to 9 March Humana will be present for the first time at BioCultura Valencia the fair of organic products and responsible consumption, that will be held in the Fira. So far the Foundation had participated only in editions of Barcelona and Madrid. 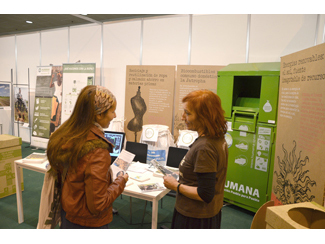 The Spanish fair benchmark for responsible consumption and ecological products expected to gather in this fifth edition in Valencia over 200 exhibitors and 20,000 visitors. Along with a sample of our work on the protection of the environment and development cooperation, Humana booth will focus on three key elements: education for development, climate change and the Tu enCAJAS? campaign. Humana will be present in the space shuttle "MamaTerra". On Saturday and Sunday, we'll conduct puppetry workshops aimed at children aged 4 to 12 years. The challenge, learn playing the values of textile recycling, environmental protection and climate change. A fun way to learn about the benefits of the 3R 's: reduce, recycle and reuse. Workshops will take place on Saturday 7th (from 11:00 to 13:00 and 17:00 to 19:00) and Sunday 8th (11:00 to 13:00). 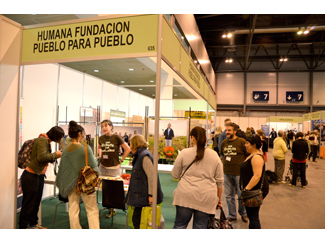 Humana is present in Valencia since 1997. It has 616 containers thanks to partnerships established with different municipalities and private companies and entities in which 1,292 tons of textiles used in 2013 were collected. See you in Hall 8, stand number 154.